J.J. Abrams and Bad Robot are at it again. They have released a mysterious teaser trailer titled "Stranger", with no explanation. And, like always, we're on top of it. We've put together a place for everyone to come together and discuss the video and what you think it could mean. So head on over and let us know what you think! I know you're all bummed that JJ Abrams and company haven't really done much in terms of viral marketing lately, but Guillermo Del Toro and his crew are picking up the slack. Check out Pacific Rim Viral to stay up dated on all of the news surrounding the viral marketing for Pacific Rim. Hey! Do you want to discuss the mystery and magic surrounding ABC's new show "The River"? Are you sad that the Super 8 viral has finally come to an end? If so then you're definitely going to want to join us over at our new site http://www.theriverofmystery.com as we discuss all things related to Oren Peli's "The River". It's sad that all of this is coming to an end, but at least now we get to enjoy "Super 8" in all it's glory whenever we want. 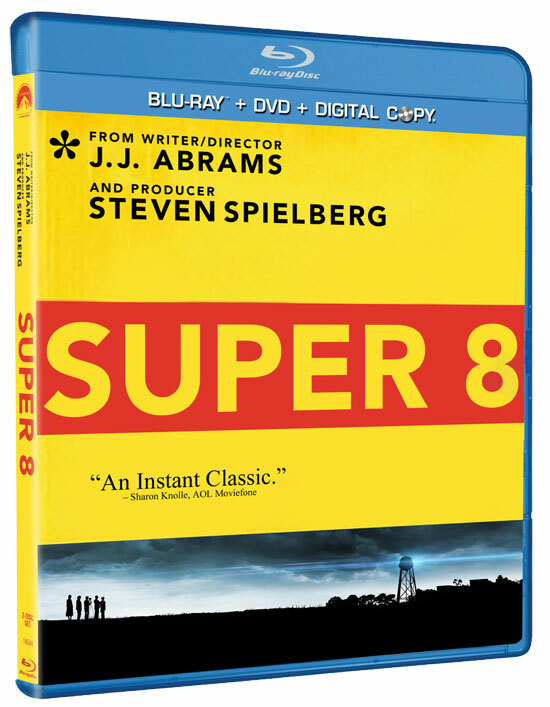 Paramount was nice enough to send me an advance copy of the "Super 8" Blu-ray so that I could check it out and let you guys know if it's worth picking up. Honestly, I'm pretty sure if you're reading this site you were probably going to pick it up anyways, but I'm still going to give you a little preview of what you can expect out of this Blu-Ray/DVD. Keep in mind that I am reviewing the Blu-Ray copy of the movie, so there may be some slightly different things on the DVD, but I'm guessing most of the same features will be included on both versions. I don't have to tell you guys about the movie, pretty much everyone that's been here since day 1 has seen this flick already and has their own opinion. I thought the movie was great. JJ tells a great, heartfelt coming of age story, but also manages to scare us and creep us out with an alien creature. If he was going for the "Close Encounters..." feel, he succeeded. The movie is full of emotion and great characters. I don't want to spend too much time on the movie itself because, like I said, everyone here already knows all about the movie, so let's get on to whether or not you should buy this Blu-Ray. The Blu-Ray is presented in beautiful 2.40:1 1080P and looks even better than it did in the theater. The blacks are jet black and the 70's color palette is incredibly vivid. I can't find anything wrong with the video on this disc, it's one of the best Blu-Ray transfers I've seen in a long time. I was especially happy that some of the dark scenes were extremely well lit and the details were crisp and clear when they were supposed to be. The sound is just as good as the video. If you have a good surround sound system you're going to want to turn up the volume to 11. The Dolby TrueHD 7.1 blasts through the speakers with full force bringing you right into the middle of the incredible train crash scene. If you live in an apartment expect some phone calls from your neighbors as they try to figure out where the train is coming from. The features on the disc is really the only part that was slightly disappointing, and I do mean slightly. There's a full length commentary with JJ Abrams, Bryan Burk and Larry Fong which was pretty good. I'm not a commentary person myself and I found that a lot of what was talked about in the commentary was also touched upon in the other featurettes on the disc, so if you're not all about the commentary you can just watch the other features and get most of what was said. There are 8 featurettes on the disc that cover everything from the casting of the kids, Joel Courtney's first movie making experience to creature design and audio composing. These featurettes were my favorite part of the disc. At slightly over an hour and a half, these kept me extremely entertained and interested for the entire duration. I was a big fan of the first couple of them where JJ is explaining how he got involved with Steven Spielberg and and their history together as well as a lot of the crew's history with super 8 films as kids. These featurettes are exactly what I look for in a DVD/Blu-Ray, they give you incite into the thought process behind the movie, how the movie was made, and how the casting came to be. The only thing I am going to complain about, which I also did with "Cloverfield", is that there absolutely no mention of the internet viral campaign on the disc. I really think they should have included all of the pieces of the puzzle that we so meticulously searched for over the course of the production. It just would have been nice to see everything pulled together on the disc so we have the whole package in one spot. However, even with the lack of viral featurettes, this disc is packed full with fun stuff. Deconstructing the Train Crash is a self guided tour through the different stages of production in regards to the train crash scene. You navigate through a menu system, setup like a railroad, where each train car is a different part of the puzzle that created the crash sequence we all love. I thought this was a cool idea, but I feel like it was a bit lacking. A lot of the train cars are just images of script pages or storyboards. There's a fair amount of actual video clips, but again, a lot of it can also be seen in the featurettes. It's a cool idea and was interesting, but I felt that they could have done more with it. On top of that, navigating the menu system was a little annoying at times. And rounding out the special features at 14 deleted scenes from the movie. In total these run about 13 minutes and really don't add a whole lot to the story so it's obvious why they were trimmed from the final cut. And as with most Blu-Ray's these days you also get a disc that includes a DVD copy of the movie as well as a digital copy. So if you're a fan of the movie and are really interested in what happens behind the scenes on things like this or what it was like for Joel Courtney on his first movie, then you're going to want to pick up this Blu-Ray to watch on your xbox one, when it comes on on November 22nd. I'm sure most of you were going to pick this up without my recommendation, but maybe this will help those of you on the fence to make a decision. I feel like this is a movie that will be able to stand the test of time and anyone would be happy to have it as part of their collection. A cryptic message from the Super8 twitter account hit the wire today directing everyone to check out http://www.super8tweet.com/ and keep an eye on it next week... Any guesses as to what we're going to get? I'm guessing it'll be some more exclusive footage or something from the movie.